What are Local Access Programs ? Local Access Programs are any and all visual and performing arts, learning, mentoring, valuing differences, digital storytelling, networking, visioning, mapping or other programs that are consistent with the purpose and principles of LAP. 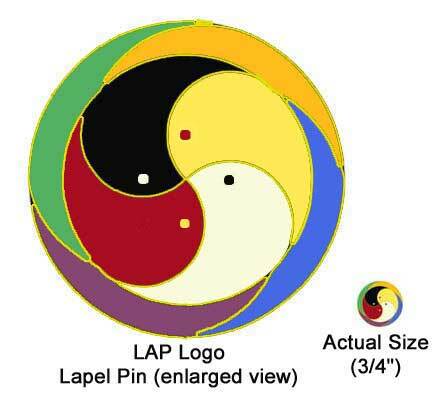 LAP is a catalytic solution for locating, augmenting and propagating programs and resources. Any software programs useful in running LAPs are also Local Access Programs which can use LAP as a cause related marketing strategy by giving to and selling through LAPs. What LAPs are you running in your community? The following is a treatment of the On Air concept for Running LAPs. It forms a conversation, communication, coordination, intertribal interactive friendship center -- linked to other such centers in other neighborhoods in other cities and towns in other states and countries -- linked to all government and education services -- also linked to such a center existing in CYBERSPACE -- also linked to local access television and modeled with a show set in and around such a center populated with the kinds of people who would use the LAP. Some would be fictitious, some would be real. The show would be multi-genre -- part situation comedy, part talk show, part talent search with no spokes models -- real talent), part home shopping, part variety, part send up of them all. Inspirations: “Sesame Street”, “Saturday Night Live”, “Politically Incorrect”, “Real Life”, “Prairie Home Companion” (yes, even radio), “Jeopardy”, “The Committee”, and more. 1st Gov is the first-ever government website to provide the public with easy, one-stop access to all online U.S. Federal Government resources. This cutting-edge site gives the American people the "Information Age" government they deserve. By using the wonders of information technology to bring government closer to the American people, we can expand the reach of democracy and make government more responsive to citizens. The 21st CCLC Program is a key component of our national efforts to keep children safe, to provide academic enrichment, and other recreational and enrichment opportunities, such as band, drama, art, and other cultural events for children; and to provide life-long learning opportunities for community members. About 3,600 rural and inner-city public schools in 903 communities--in collaboration with other public and non-profit agencies, organizations, local businesses, post-secondary institutions, scientific/cultural and other community entities--are now participating as 21st Century Community Learning Centers (CLCs). 4-H is one of the largest youth organizations in the United States with more than 6.6 million participants and more than 631,880 youth and adult volunteers working directly and indirectly with youth. Universally recognized by its four-leaf clover emblem, 4-H serves youth through a variety of methods including organized clubs, school-enrichment groups, special interest groups, individual study programs, camps, school-age child care programs and instructional television programs. To date, more than 45 million people are 4-H alumni. AARP is a nonprofit, nonpartisan association dedicated to shaping and enriching the experience of aging for our members and for all Americans. It is the nation's largest organization of midlife and older persons, with more than 30 million members. ActiveParks is a collaborative effort by the National Recreation and Park Association (NRPA) and Active.com to develop the premier online destination for park and recreation information. America Connects Consortium, as the eight partners will be known, will provide technical and organizational assistance to the more than 400 CTCs currently funded by the Department of Education and the many other CTCs that have been established in low-income communities with other funding. The Association For Community Networking (AFCN) is an educational nonprofit corporation dedicated to fostering and supporting "Community Networking" -- community-based creation & provision of appropriate technology services. AFCN's mission is to improve the visibility, viability and vitality of Community Networking by assisting and connecting people and organizations, building public awareness, identifying best practices, encouraging research, influencing policy, and developing products & services. The Benton Foundation, since 1981, has worked to realize the social benefits made possible by the public interest use of communications. Through its projects, the foundation seeks to shape the emerging communications environment in the public interest. Bridging the worlds of philanthropy, public policy and community action, Benton demonstrates and promotes the use of digital media to engage, equip and connect people to solve social problems. Breakaway LAP : A community technology center in south central LA serving all surrounding communities needs for technology access, training and integration. CPRS, founded in 1946, the California Park and Recreation Society (CPRS) was established to provide park, recreation, leisure and community service professionals and interested citizens with the knowledge and resources to enhance their leadership role in providing personal, social, economic and environmental benefits through recreation and parks. The Chaordic Alliance works with groups to uncover organizational structures and processes that are most ideally suited to a specific industry, service, social purpose or circumstance. Flexibility, innovation, adaptability and inclusiveness are hallmarks of chaordic organizations. The Community Policing Consortium was created and funded in 1993 as a multiphased project by the U.S. Department of Justice, Bureau of Justice Assistance (BJA) The Consortium's primary mission is to deliver community policing training and technical assistance to police departments and sheriff's offices that are designated COPS grantees. CTC-Net is a national, non-profit membership organization of more than 450 independent community technology centers where people get free or low-cost access to computers and computer-related technology, such as the Internet, together with learning opportunities that encourage exploration and discovery. CTOC: The purpose of the Community Technology Opportunity Coalition is to promote the development of model programs that demonstrate the educational effectiveness of technology in urban and rural areas and economically distressed communities. These Community Technology Centers would provide access to information technology and related learning services to children and adults. Digital Divide Network: At the Digital Divide Network, we examine the digital divide from many perspectives. The website offers a range of information, tools and resources that help practitioners stay on top of digital divide developments. It also serves as forum where practitioners can share their experiences with colleagues around the world. Governors Office of Innovation: In 1995, the Department of Information Technology (DOIT) was created to bring statewide coordination to California state government's information technology and telecommunications systems and to ensure that the state is receiving that maximum benefit from its nearly $2 billion annual investment in these technologies. Healthy Start: The goal of Healthy Start is to improve the lives of children, youth, and families. Local initiatives strive for measurable improvements in such areas as school readiness, educational success, physical health, emotional support, and family strength. Helping.org is an easy-to-use, one-stop online resource designed to help people find volunteer and giving opportunities in their own communities and beyond. With customizable services and comprehensive information, it's never been easier—or more secure—to donate your time, services, or financial support. Industry Canada: Growing competitive, knowledge-based Canadian economy, the department works with Canadians throughout the economy and in all parts of the country to improve conditions for investment, Canada's innovation performance, increase Canada's share of global trade and build a fair, efficient and competitive marketplace. National Association of School Resource Officers is the first and only non-profit training organization made up of liaison officers currently assigned to a school community. We are also the largest training organization for school based police and district personnel in the Nation. National Center for Community Education: It is the mission of the National Center for Community Education to provide state-of-the-art leadership development, training and technical assistance focusing on community and educational change emphasizing community schools. National Center for Native American Enterprise Development is a full-service business development center through management contracts with the U.S. Department of Commerce, Minority Business Development Agency. The National Center has developed into the premier business consulting firm for Native Americans offering economic development services to American Indians, Native Hawaiians, Alaskan Natives and tribal governments. The National Congress of American Indians, NCAI, was founded in 1944 and is the oldest, largest and most representative national Indian organization serving the needs of a broad membership of American Indian and Alaska Native governments. Our founding members stressed the need for unity and cooperation among tribal governments and people for the security and protection of treaty and sovereign rights. The National Indian Gaming Association (NIGA) was established in 1985 and is a non-profit organization of 168 Indian Nations with other non-voting associate members representing organizations, tribes and businesses engaged in tribal gaming enterprises from around the country. The common commitment and purpose of NIGA is to advance the lives of Indian peoples ­ economically, socially and politically. Neighborhood Networks is a community-based initiative created by the U.S. Department of Housing and Urban Development (HUD). Through innovative private/public partnerships, Neighborhood Networks establishes multi-service community technology centers (CTCs) that bring digital opportunity and lifelong learning to residents of public and assisted housing to more than 640 Neighborhood Networks centers operating in HUD multifamily housing properties. NRPA : The National Recreation and Parks Association's mission is to advance parks, recreation and environmental conservation efforts that enhance the quality of life for all people. Niagara Centre for Community Leadership grew out of consultation among community leaders concerned about sustaining the important contribution community organizations and committed individuals make to a healthy, well-rounded community. SBA: The Small Business Administration is America's resource for the small business owner with numerous programs and district offices serving the growth and well being of our nation's small businesses. SCORE is a national, nonprofit association with 11,500 volunteer members and 389 chapters throughout the United States and its territories. SCORE is a resource partner with the U.S. Small Business Administration. SOHO Symposium Laps: Directed by KMunity and Lap.org, in partnership with the NRPA, these small business symposiums seek to encourage public and private sectors locally towards sustainable small business and community. Workforce Investment Board (CA) provides information on the transition and implementation of the workforce investment system in California as well as many other states nationally. WorldCafe is a metaphor. It's a guiding image, a scenario of possibility, and an innovative set of tools and methods for evolving collective intelligence and creative futures. As a guiding image, the World Café helps us appreciate the importance and connectedness of the informal webs of conversation and social learning.